A three hour drive saw us arrive in the area and, after a quick stop in the nearby town of Mortagne-Au-Perche for some provisions at the big supermarket, we found our way to the lake, hidden in the folds of a small valley. We arrived a short while after the other Angling Lines field test team of Jim Kelly and Paul Cooper had departed, as they had fished the week previous. They had caught well, with over 50 fish between the two of them fishing mainly the day time. So when Joanne (who looks after the lake for owner Philipe Blime) welcomed us with that news, we felt like we could be in for a productive week. Typically we had brought the weather with us and steady rain and a northerly wind had set in. Surely it couldn’t be another cold week like the one we had experienced at the nearby Angling Lines venue, Deux Iles, just a month before. Our fears however were allayed when Joanne informed us that the weather was due to improve as the week went on. Sticking on our wellies and waterproofs we set about doing a recce of the lake, to find the likely spots that would hopefully produce us a few big French carp. There wasn’t much sign of movement on our first lap but Joanne had informed us that the better of the fish had been coming out of the deeper water towards the dam wall. We both fancied the first swim on the cabin side so had to let chance decide who would be in pole position for the week ahead. I tossed the coin as Matt called heads (which he won) so he set up in the first swim whilst I set up in the middle swim on the cabin side.  We had heard that the top swim in the shallows had been producing a large number of fish throughout the day time so the plan was for us to both target the bottom and middle of the lake during the nights and spend the day doubled-up in the shallows. during the day and the shallower swim during the night. We hoped this would mean that no area received too much pressure at any one point and we could maximise the number of bites we had, both day and night. I quickly whipped up my brolly during a lull in the rain and set about making camp for the week. After another couple of hours of sporadic rain, the wind dropped and sun made a very welcome appearance. Popping in to see how Matt was getting on he had decided to drop his rigs, with the aid of the bait boat, to the dam wall and far margin, whilst also prepping a mid-water spot for later in the week. I, on the other hand, would be mainly casting so opted to fish one rod to the near margin, one to mid water and one to the far bank, as tight to the trees as possible. That way I hoped I could quickly determine where the fish would prefer to feed then gradually focus all my efforts on the most productive area as the week progressed. As the evening wore on everything was in position and it was time to get something to eat before turning in for the night. Before I could get the stove fired up Matt had shouted he was into a fish, a lovely, well-proportioned mid-20 mirror carp that by all accounts fought incredibly hard. Not long afterwards my far margin rod locked up and sounded a few bleeps on the alarm. I bent into the fish which hung on for a few seconds then gave me the slip! Cursing under my breath I pinged the rig back out which luckily landed bang on the spot again. As dusk set in Matt’s middle rod was away again, this time however the fight was incredibly strange, as the fish put up little resistance and sulked it’s way into the margins beneath us. 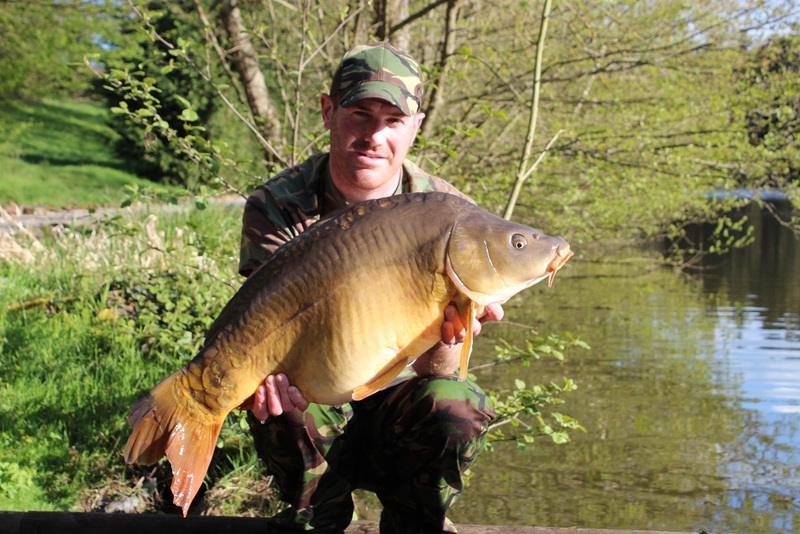 At first Matt thought he’d hooked a large bream but when a set of broad shoulders appeared on the surface a couple of rod lengths from the boards, there was no doubt it was a carp and not a bad sized one either. I did the honours with the net and once it was on the unhooking mat we could see why it had fought so strangely. The fish was goggle-eyed! 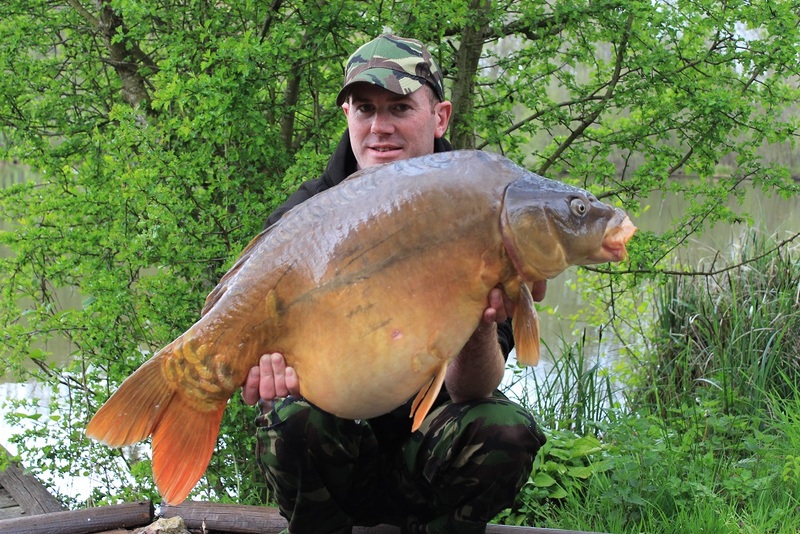 It was one of the weirdest looking carp I’d ever seen and had us in stitches. 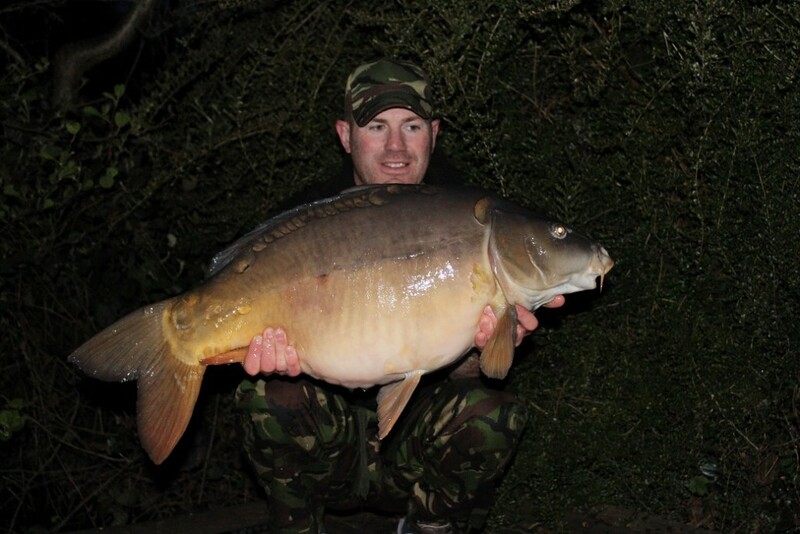 At 30lb 10oz however it was Matt who had the last laugh, having bagged a couple of nice fish and the first 30 of the trip in a matter of hours. The first 30 of the trip, all looks normal. Looks can be deceiving! 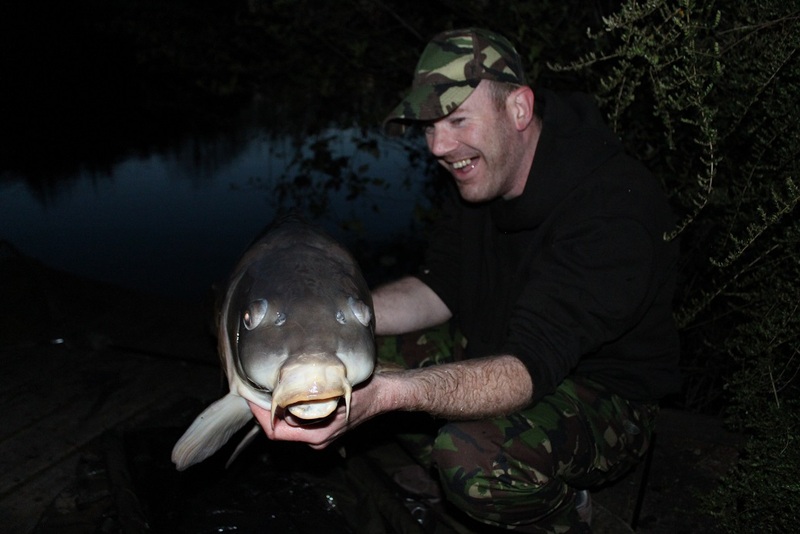 A rather strange Goggle-eyed carp! I’d been stricken with the dreaded man-flu just a few days before we were due to depart and I wanted to ensure I didn’t sound like a train announcement for the film I needed to make in the days ahead. So I loaded myself up with cold and flu tablets and got my head down. There’s always something quite therapeutic about sleeping out in the fresh air and it wasn’t long until I drifted off into a deep sleep. After a quiet night I woke feeling infinitely better just before dawn. Listening to the amazing dawn chorus whilst gradually coming round was a magical feeling and could only be topped off with a run. No sooner had the thought popped into my head than the far margin rod sounded a couple of bleeps as the indicator rose, the line drew taught and the rod tip looped up. Feeling a little more switched on than the previous evening, I gave the fish no chance to slip the hook this time and, after a plodding fight, with a few hairy moments under the nearside marginal trees to my left hand side, the mesh engulfed another solid looking mirror carp which weighed in at a few ounces over 23lb. It’s always a relief to get that first fish under your belt, particularly when you are there to film a lake, so my confidence took a big step up as I slipped the fish back to fight another day. The sun was already rising brightly over my shoulder and warming up the far margin nicely, so it looked like Sunday was going to be bright, warm and pleasant. The perfect weather to get some filming under the my belt. Matt had decided to drop in on the shallows swim whilst I did some filming and he flicked a couple of pop-ups to a fallen tree directly opposite the boards, at about 50 yards range. Scattering a few baits out with the throwing stick he settled into for the day in anticipation of a bit of action. 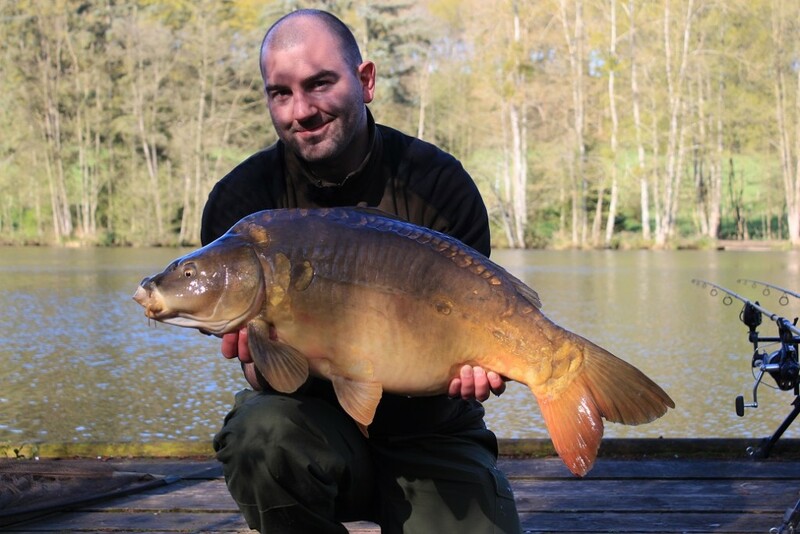 It didn’t take long before one of the rods screamed into life and another La Fonte carp was added to the tally. 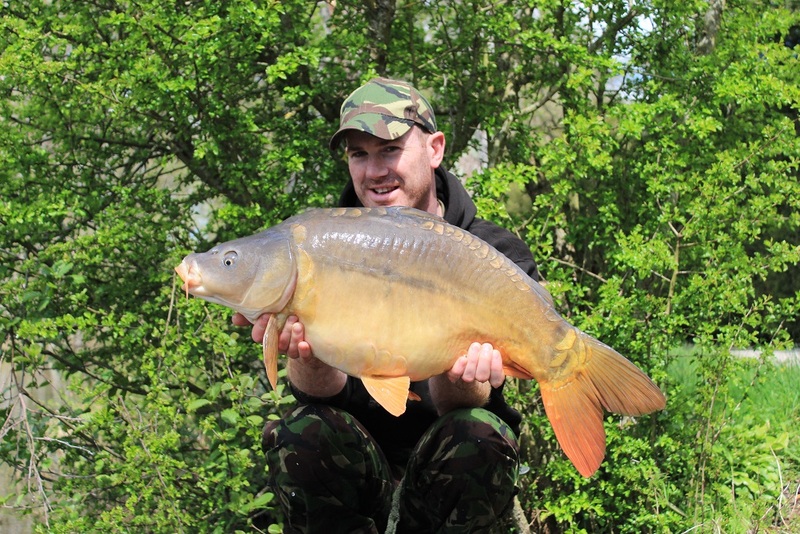 Another lovely mid-20 mirror posed for the camera and no sooner had it been slipped back than Matt’s other rod locked up. 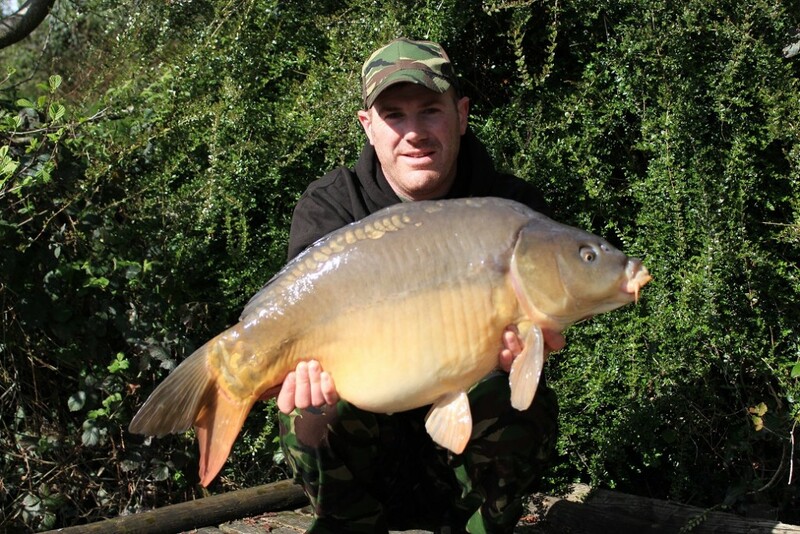 Immediate action – another mid-20 within a few minutes of casting in the shallows. I managed to shoot some footage of the fight in the glorious sunshine as Matt did battle with another solid fish. 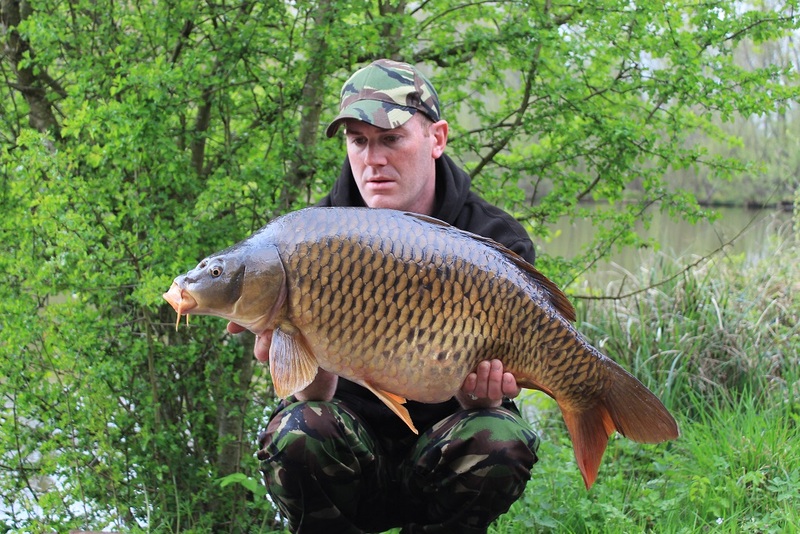 As the fight wore on Matt remarked that he thought it was a much better fish and, when it turned a little way out in front of us, we could see it was a solid looking common. Deciding it was better to film a fish of this calibre on the bank rather than risk losing it at the net, I jumped from behind the camera and on to the netting duties and before long an immaculate 35lb common was in the net, ready to have its picture taken. What a cracker! 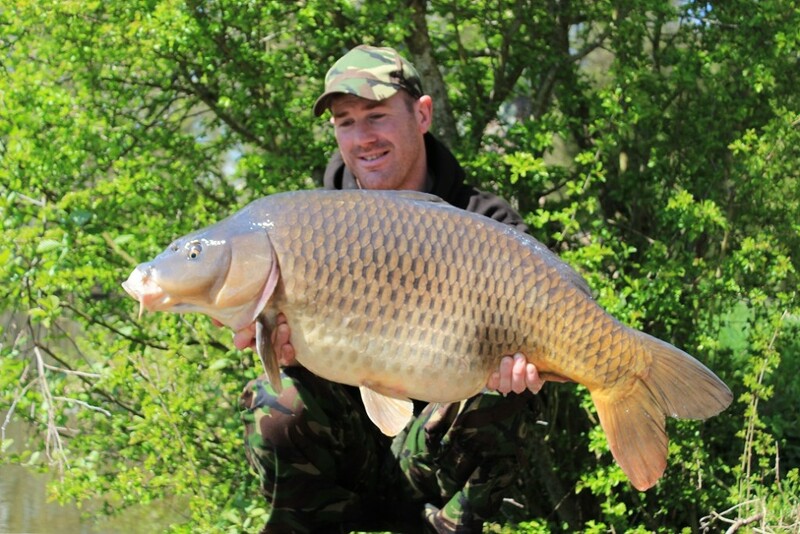 35lb of immaculate La Fonte common carp. It was an absolute peach of a fish and I was more than a little envious of Matt’s capture. Firing off a few still shots and some footage we waved farewell to another cracking fish. 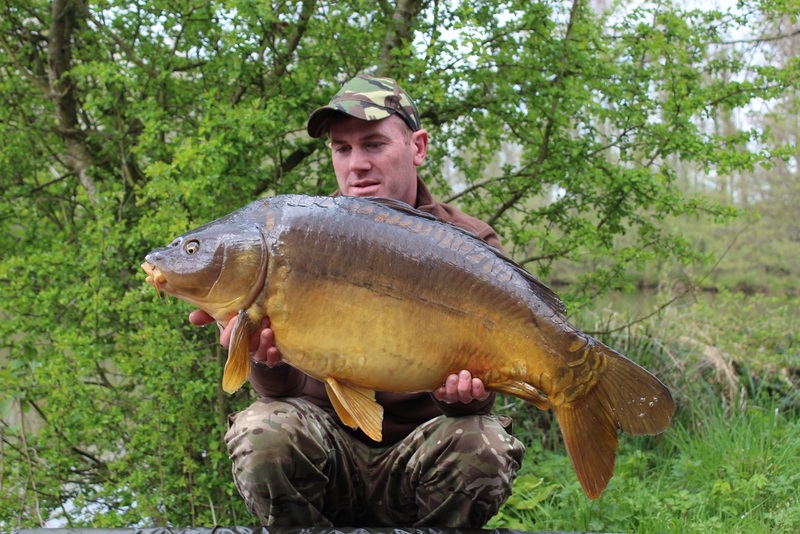 The tally of carp was really starting to build and it was only Sunday! As the afternoon wore on Matt added another couple of nice mirrors to his list and as the sun’s rays began to dip behind the hill on the far bank, Joanne and her boxer dog Gaby paid us a visit. Gaby, my new four legged friend. Gaby is a rescue dog and although she is used to meeting fisherman can be quite timid and wary. 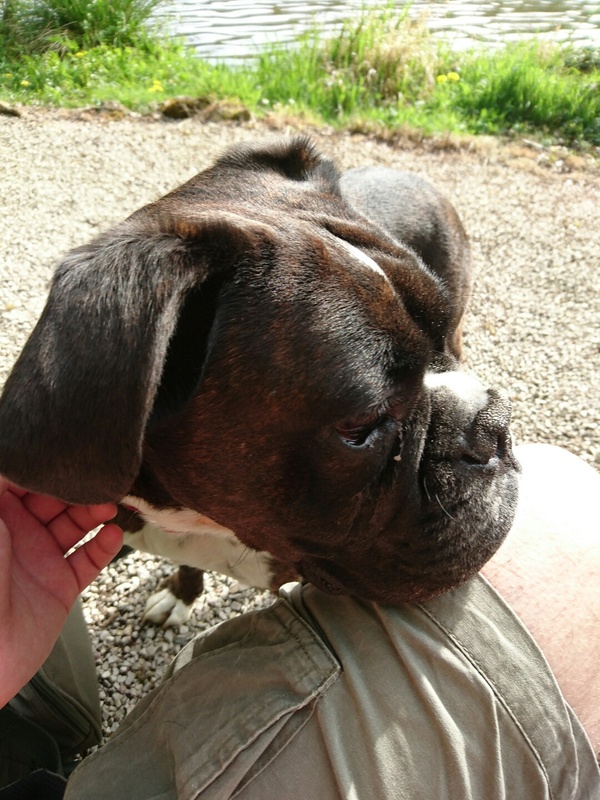 However we hit it off straight away and I knew within in minutes I’d made a new four legged friend. Whilst sitting and discussing our captures so far with Joanne Matt was suddenly back into the action as another heavy mirror found it’s way into the net. Rounding off a productive afternoon with another chunky mirror. We decided to stay on in the shallows until early evening then get the rods back out in the main spots on last light. 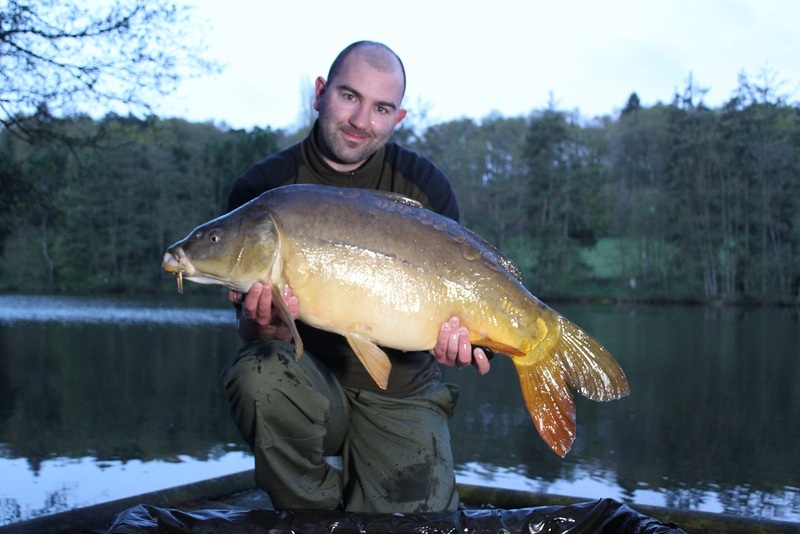 Matt landed a solid mirror in the early hours, followed by another as the chilly morning air clung to the lake shortly after first light on the Monday. One of two early morning bites for Matt. I had offered to help Philipe’s caretaker pick up a new bait freezer on the Monday morning so Matt continued to fish the dam wall swim and agreed that we would make our way up to the shallows when I got back. Returning at just before noon we promptly cast out in the shallows and, before long, we found ourselves in carp fishing bedlam! It was total chaos as we experienced not one but three double hook ups! It was fantastic fun and we caught some beautiful carp during the afternoon. By now we had fast approaching 20 fish between us and it was only Monday! The weather had also remained gloriously hot which added a real holiday feel to our trip. We continued to catch some more cracking fish that afternoon, Matt weighed in with more 30’s whilst my best of the mini session topped 27lb. Matt added yet more fish to his tally during the night, including another 30 whilst I again had a largely quiet night until the first cracks of light began to appear and the far margin rod burst into life. The fight was persistent and dogged, as the fish used it’s weight in an attempt to outwit me. However it was me who won the battle and I had another better quality fish ready for weighing. This short, stocky character weighed in at 29lb 8oz. 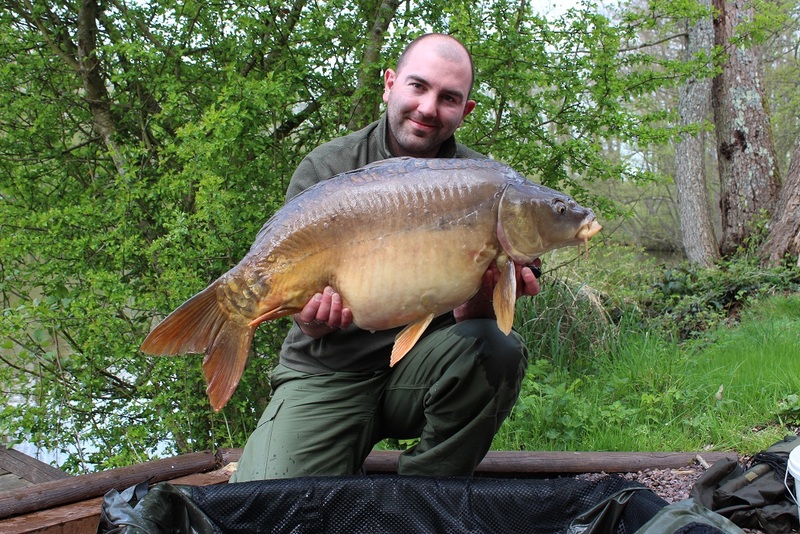 I was edging closer to the 30lb mark and the better fish were definitely starting to put in an appearance. 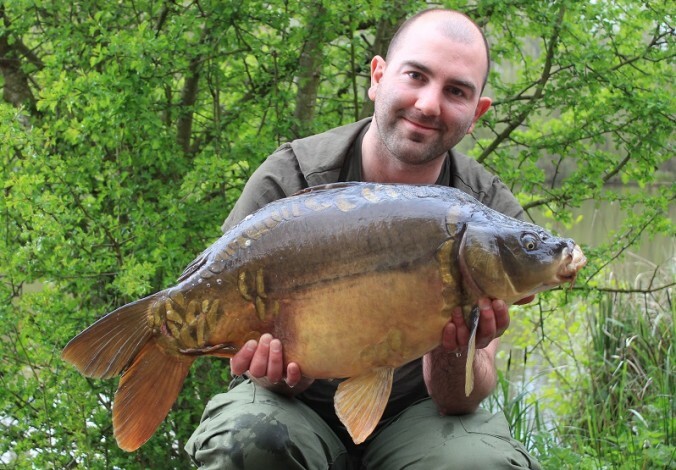 The far margin rod has started to produce some better fish. By now we had the routine firmly established so after breakfast and a few coffees Matt made his way up to my swim and we both set up in the shallows for what we both hoped would be another productive day. And so it proved to be once again as we caught consistently throughout the day, up until around 4pm when I had to make my way to the house at the bottom of the lake to do some more filming. 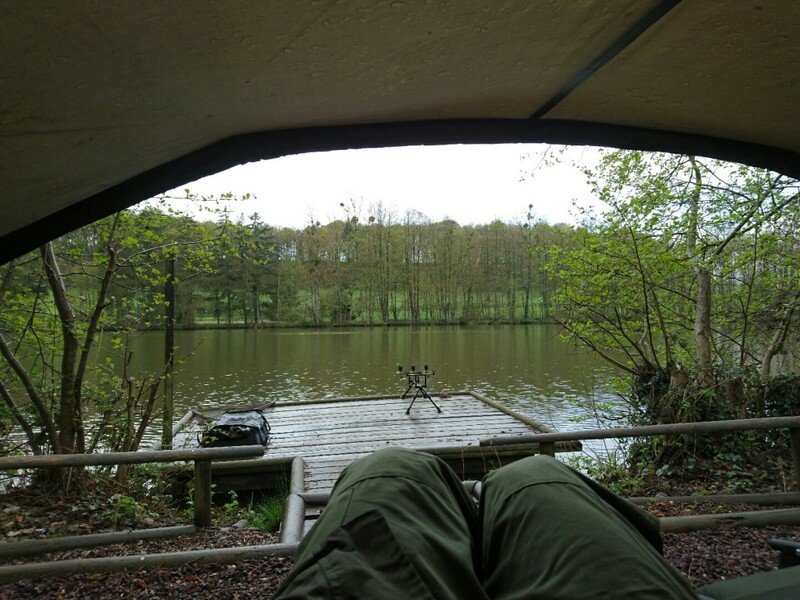 Returning back to my main swims at around 7pm I got the rods in position and settled in with a brew and a book. As the last of the sun cast its warms rays across the lake my far margin rod was off again. This time the fight felt more considered and deliberate, the hallmark of a better fish. 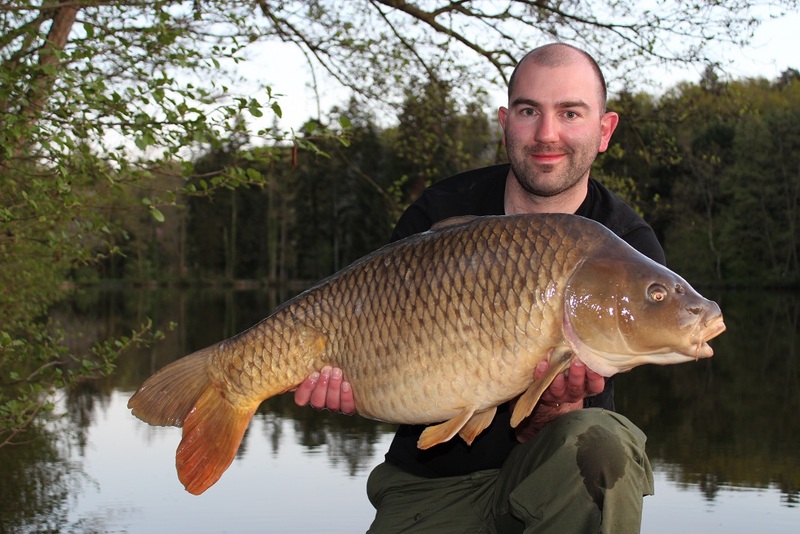 After gradually gaining the upper hand over the fish, it rolled a little way in front of the boards and I could see that it was my turn to be fighting a good common. Praying to the fishing gods that the hook would hold for a few moments longer the fish was inched into the net. 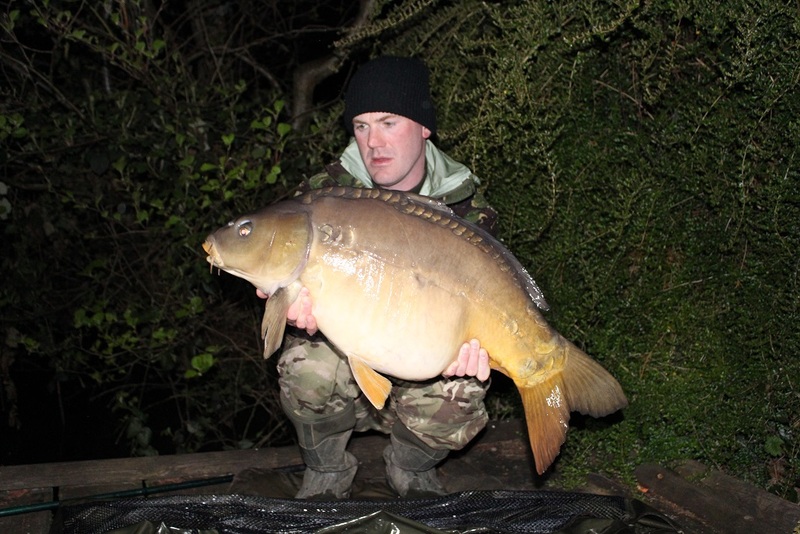 The scales confirmed what we both suspected, that I’d got my first 30 of the trip at 30lb 9oz. The common’s broad golden flanks mirrored glowing rays of sunset and it made for a lovely photograph in the early evening light. Finally into a 30! A cracking common in the early evening light. Slipping the fish back into the depths I hastily got the rod back out on the hot spot and settled into for the night. At around midnight an almighty screech rang out across the lake from the far side. It certainly made my ears stand up and before I had chance to wonder what had made the noise, a reply from directly behind my bivvy firmly grabbed my attention. A pack of wild boar were making their way across the surrounding woodland and one had been split up from the group. Within a minute or so there were boar sounding off in large numbers directly behind my swim. Realising they meant us no harm I sat in silence as they scuffed their way through the undergrowth and off into the night. Whilst it was a little alarming at first I did feel rather privileged to have witnessed another amazing feat of nature. Carp fishing in France is always an adventure to be enjoyed for many different reasons and I always try to take something different from each trip I take and this close encounter certainly ticked that box!